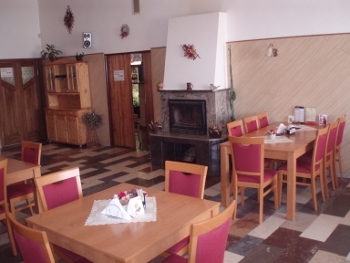 There is a restaurant in the hotel, which was reconstructed in 2005. There is dining room, bar, lounge and gaming-house in restaurant. Separate loung with capacity of 18 seats is suitable for smaller actions. Bar has capacity 35 seats. There is big plasma screen in bar(50') with many sports canals in the bar. That makes from bar ideal place for watching sport matches in great atmosfere. Gamming -house has billiard table, table socer, jukebox, darts and slots.